Serves as an aggregator for many different shops. A selection of shops is not applicable, as these are given by eBay. Compensation occurs on the basis of clicks, therefore no commission for sales. Only interesting if you want to configure as little as possible. Login in publishers.ebaycommercenetwork.com into your account. 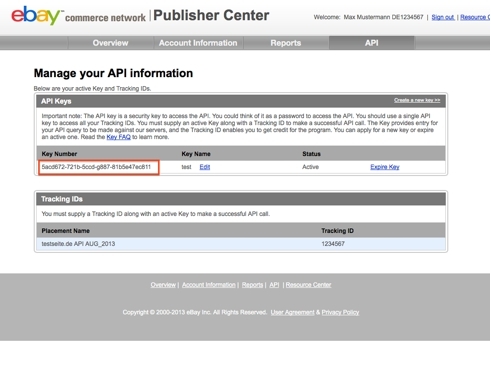 Click in the menu on API. If you have not yet created a key, click on create a new key. 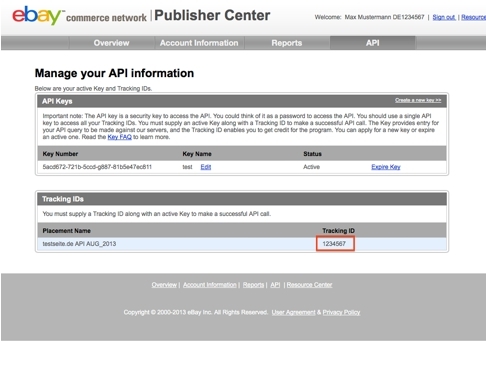 Login in publishers.ebaycommercenetwork.com into your account. You can find the tracking ID at the end of the page.